Subway's $3.50 Sub of the Day hits the national stage this month and can be found at participating locations for a limited time. 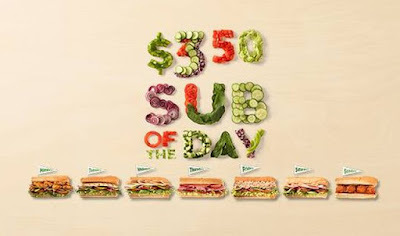 The deal was previously available in select markets and features a different 6-inch sub for each day of the week that is discounted to $3.50 on that day. - Thursday - Italian B.M.T. Some markets are also offering the option to include the sub of the day in a combo with chips and a drink for $5. Unfortunately, in some markets, the deal was actually less ($3) and went up in price to meet the nationally promotion.